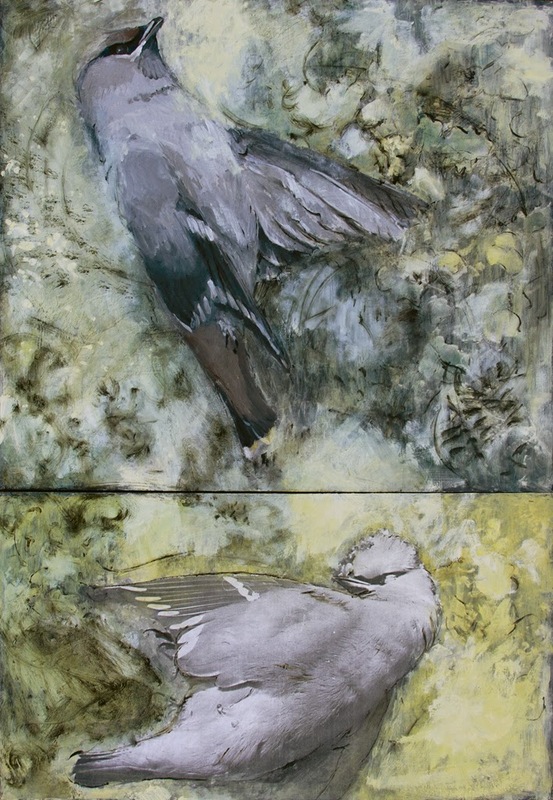 Debra Bachman, "Flight of Fiction, 2014", diptych, oil and acrylic on photograph, 36" x 30"
Bachman says of her work: For thousands of years, long before the valley was settled, the North Saskatchewan River has endured – flowing, flooding its banks, freezing into silence, then gradually thawing, repeating an endless cycle of death and renewal. Each year, flocks of migrating Bohemian Waxwings descend into the Valley, signaling the arrival of spring and the release of winter’s icy grip. This work was inspired by my all-season walks along the North Saskatchewan River at Buena Vista Park in Edmonton.